Zoom! 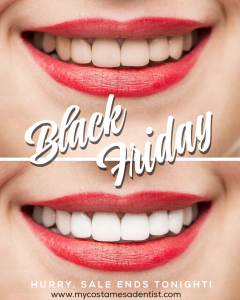 Teeth Whitening is a professional, in-office teeth whitening that can whiten teeth up to 8 shades lighter in just one hour! Zoom! is a proven professional teeth whitening system. The whitening system is an in-office procedure performed by a trained dental assistant. A prescription strength hydrogen peroxide bleaching gel with pH booster is applied to your teeth andbreaks down stain forming molecules on tooth enamel. This process is accelerated by Philips Whitespeed Blue LED Lamp. The intensity of the lamp can be adjusted depending on desired results and risk of sensitivity. The procedure is performed in 15-minutes sessions and up to 4 sessions can be completed. Discuss the best option for you during your consultation with Dr. Jorgenson. Zoom! Teeth Whitening works by breaking down stains on the teeth. This process can cause sensitivity that is often described as “zingers”. 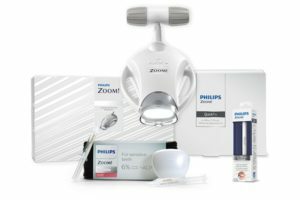 You’ll want to be sure to have a consultation with Dr. Jorgenson to ensure Zoom! is appropriate for you. If you’re concerned about sensitivity, start prepping about two weeks prior to your appointment. Use a toothpaste with potassium nitrate such as Sensodyne. The toothpaste will help to temporarily block pain signals triggered by the bleaching gel. You can also take up to 800mg of ibuprofen about one hour prior to your appointment. Because the process is designed to remove stains from the enamel, plaque and tarter should be removed prior to the procedure. If teeth are covered by plaque and tartar, the whitening gel must fight through this hard substances before getting to the enamel. Therefore, you’ll want to make sure teeth are clean. We highly recommend a dental exam and cleaning to remove plaque and tartar for best results. You can schedule your dental cleaning at our Costa Mesa dental office anytime by calling (714) 424-9099 or visit us at www.mycostamesadentist.com. If sensitivity persists, apply your Relief ACP gel to relieve sensitivity and to help remineralize the teeth. More importantly, you can maintain excellent oral health by visiting your dentist as prescribed and keep up good at-home brushing and flossing habits. Advanced Dental Care is a full-service dental office in Costa Mesa, CA conveniently located by the 405, 55, and 73. For questions or to schedule an appointment, please call/text (714) 424-9099 or visit us online at .